Although white is the traditional color for wedding dresses, more and more brides are striking out on their own colorful paths. Blue wedding dresses is an excellent choice for those brides who are a little more brazen than blush and a little more daring than ivory. 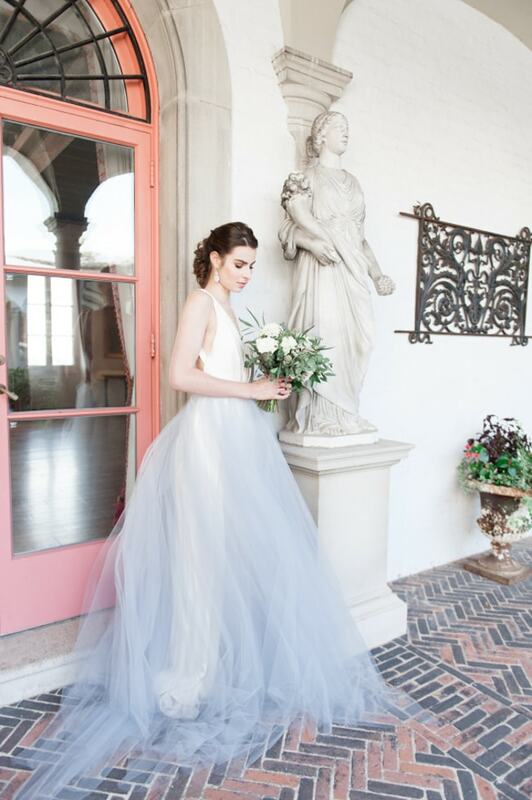 This light blue gown is dreamy and ethereal. The fitted bodice gives way to a trumpet-style skirt that features lots of volume and drama. This bead-free design lets the color truly steal the show. For a fairytale fashion statement, this long-sleeve blue dress takes us back in time. With an illusion neckline and sleeves, and a long layered train, this pale blue design evokes youthfulness and grace. If you can’t quite let go of the traditional look, this white and blue ball gown is a great option. A white V-neck top is paired with a billowy blue tulle skirt for a lovely, modern contrast. Simple accessories offer a nice balance to the fashion forward frock. For the bride who dreams in darker colors, this navy blue gown is exquisite. Short sleeves, a gathered waistline and delicate floral appliques on the hem of the skirt show off modest detail. This design exhibits remarkable contrast to any venue or location. There’s nothing sad about wearing blue on your wedding day. Whether it’s your favorite shade, it fits your theme, or it’s simply what you look best in, don’t shy away from this cool color alternative.